When the Asset Owners Disclosure Project released its 2017 Global Climate Index last April, it came as no surprise that Canadian pension funds continued to lag behind their peers in addressing climate risks. No fund earned the designation of “Leader,” and nearly one quarter of the country’s largest asset owners were taking no discernible action on climate change whatsoever. Glimmers of progress since then – namely, the Caisse de dépôt et placement du Québec announcing plans to slash the carbon footprint of its portfolio by 25 per cent by 2025 and a coalition of funds that includes the Caisse, Public Sector Pension Investment Board and British Columbia Investment Management Corp. calling for enhanced climate disclosures from Canadian companies – have not tempered claims that the sector as a whole is dragging its heels on climate action. And nor should they. These steps, however positive, represent only a handful of the 17,000 pension funds in Canada, collectively worth over $1.5 trillion. But while the sector’s persistent investment in oil (as well as its close relationships with the extractives industry) has faced scrutiny, a key reason for our plodding pace on climate action often goes overlooked: Canada’s pension regulation. It’s not as yawn-worthy as it sounds. Regulation goes a long way in shaping how funds invest, and a motivated government could use regulation strategically to accelerate the shift towards a low-carbon economy without compromising the pension promise. Unfortunately, current pension regulation in Canada actually serves as a barrier to climate-conscious investment in several ways. Case in point: the lingering ambiguity over the limits of fiduciary duty, the legal responsibilities that pension trustees have to their beneficiaries. In theory, these obligations should make climate action a no-brainer. Trustees have a duty to both current and future beneficiaries, and a wealth of evidence warns that unmitigated climate change will have catastrophic effects on financial portfolios (research also increasingly suggests that green investments produce similar or even superior returns). In practice, however, a great deal of uncertainty remains among pension trustees about the legal permissibility of acting on climate change, especially among smaller, private funds. 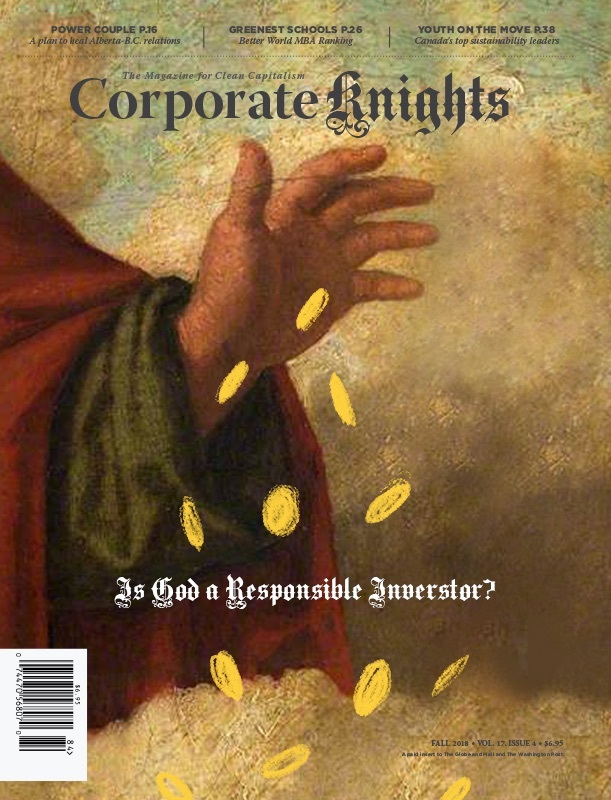 Recent interviews conducted for Fiduciary Duty in the 21st Century, the landmark report from the Principles for Responsible Investment, UNEP Finance Initiative and others, reveal that Canadian pension trustees are split over whether or not fiduciary duty even allows them to consider non-financial factors, such as the environment, in investment decision-making. This comes despite major public funds such as the Canada Pension Plan explicitly endorsing responsible investing practices. Moreover, legal advisers and consultants continue to reinforce a narrow definition of fiduciary duty that excludes environmental considerations. The reason for this confusion? A lack of clarification from regulators. To date, only Manitoba and Ontario have issued guidance informing trustees in their respective jurisdictions that fiduciary duty does not preclude them from considering environmental factors. The federal government has refused to follow suit, despite calls to do so for more than a decade. Adding another layer of ambiguity, neither regulator that has broached the topic has stipulated that funds should consider environmental factors as part of their fiduciary duty – only that they can. Here’s another hurdle: Canada has a glaring deficit of regulations to encourage climate consciousness among pension trustees, even if only to ensure Canadians’ benefits are adequately protected. Without these, funds are left to their own devices in assessing and managing climate risks. This wouldn’t necessarily be a problem, except for the sector’s notorious short-termism. As the CIO of the world’s largest pension fund, the Government Investment Fund of Japan, recently acknowledged, institutional investors remain preoccupied with short-term returns, despite many having long-term mandates. In a November 2017 piece for Investment & Pensions Europe, Raj Thamotheram and Edward Waitzer lamented several “elephants in the room” of the global investment industry obstructing systemic change. These metaphorical pachyderms include: performance incentives that run against long-term value creation; questionable asset mixes; and a “narrow gene pool” of trustees committed to innovation. Add in the unfortunate norm of herding behaviour, and we can see that any widespread shift in investing practices faces considerable inertia. 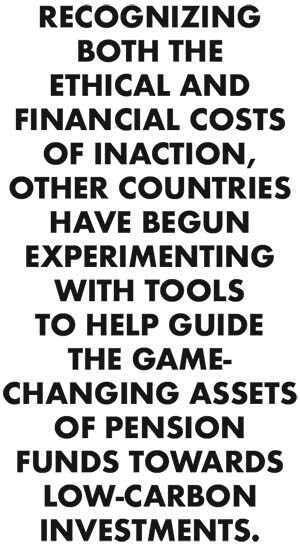 Recognizing both the ethical and financial costs of inaction, other countries have begun experimenting with tools to help guide the game-changing assets of pension funds towards low-carbon investments. These include: disclosure requirements about how funds are considering environmental factors (U.K., Germany and others); mandatory reporting on how funds are considering climate risks and how their investment policies align with national climate change goals (France); compulsory carbon reporting (threatened in Sweden if the sector could not get its act together on self-reporting); mandatory climate stress-tests (also considered in Sweden); and most drastically, divestment from coal (Norway). Of these tools, only one has been adopted in Canada and this, only in Ontario. As of 2016, pension funds there are required to annually disclose if and how environmental (and social and governance) factors are addressed in the plan’s investment policies. This measure is light-touch (some might say too light-touch), intended to nudge funds towards considering sustainability without being prescriptive. But even being pain-free for asset owners, it has failed to find wider uptake outside Ontario: recommendations for similar regulation in other provinces have gone ignored, and two private member’s bills to mandate such disclosures by federally-regulated pension funds failed in the House of Commons. Disclosure requirements bring up another angle in this discussion. The information that funds make available to beneficiaries affects the latter’s ability to monitor and challenge their pension’s environmental footprint. Despite the contentiousness of turning pension funds into a hotbed for climate activism or mingling retirement savings with socially-responsible investing goals at all, pensions do have inherent democratic potential. And for decades, beneficiaries have been claiming a say in how their money is invested, with examples of successful divestment campaigns worldwide from tobacco, arms companies and, yes, fossil fuels. But more basically, beneficiaries are entitled to know how their investments are being protected against potentially devastating losses. Weak disclosure requirements create a stumbling block over the very first step in holding trustees to account and, unfortunately, weak disclosure requirements are what we have. As noted, only Ontario requires funds to disclose if and how they consider environmental factors, leaving approximately 10,000 funds outside the province with no such requirement. Nowhere in Canada are funds obligated to disclose their proxy voting records (though a few do so voluntarily), yet shareholder engagement is frequently cited as a preferred method to manage climate risks among funds claiming to care about these. And might we think further about Ronald Davis’ recommendation in Democratizing Pension Funds: Corporate Governance and Accountability, that Canadian pension funds be required to disclose corporate governance policies in their Statement of Investment Policy and Procedures? Underpinning all of these barriers to climate-conscious investment is another problem, perhaps the thorniest of all: remedying any one issue at a sector-wide level requires navigating a minefield of regulators. Canada’s pension scene has 10 independent regulators. Plans are overseen by either their respective provincial authority or the federal Office of the Superintendent of Financial Institutions (OSFI), depending on employees’ line of work. Exceptions to this are funds in the territories, which are regulated by OSFI; those on P.E.I., where there is no regulator at all; and funds that are the product of specific legislation, such as the CPP, which are governed by their respective acts. Despite a national association intended to harmonize pension oversight, coordination between jurisdictions is limited, and calls for a single, overarching regulator have been muffled under the wheels of inefficiency. Successful alignment of pension assets with climate goals, in other words, requires either a piecemeal approach, herculean efforts of coordination and leadership or restructuring the regulatory framework altogether. None of this is to excuse climate inaction by pension trustees (look at the initiative taken by the Caisse and other individual funds). Nor is it to say that we should leap headlong into using Canadians’ retirement savings for political purposes. Rather, my point is that against the urgent need for green investment, Canadian pension funds are playing in a system that is largely rigged against climate action. Let’s untilt the table. Addressing the barriers discussed here requires an array of regulatory amendments across multiple jurisdictions, but most of these measures, such as clarifying the limits of fiduciary duty, are relatively painless. More broadly, let’s bring pension regulation into our thinking about climate solutions in Canada. At a time when governments seek quick wins on climate change, when divestment campaigns aimed at large public funds face an uphill climb, and when Canadian pensioners deserve security against devastating, preventable losses, targeting pension regulation could reach beyond the investment practices of the few biggest players, and shift the course for the entire sector.